Rabbi Barbara Aiello officiating at the bar mitzvah of Tyler Waldman. Later, while searching local genealogical records, he discovered that the name Mascaro did not appear in Italy until the 1500s—though it had been prevalent in Spain centuries earlier. Something else seemed odd. Born in 1941, when twins were being sought by the Nazis for medical experiments, Mascaro’s birth record specifically noted that he and his twin brother, Renato, were of the “pure Aryan race.” Only later, as he began history studies in college, did it dawn on him: His family must have originally been Jews. However, he did not act on his suspicion until four years ago, when Italian American Rabbi Barbara Aiello came to his village and started outreach programs to those who believed they might have Jewish roots. Today, Mascaro has joined a growing number of southern Italians who are reconnecting to their Jewish heritage and finding ways to participate in communal life after almost 500 years without an organized Jewish presence in the region. Historians have long been aware that the area south of Naples—once a separate nation called the Kingdom of Naples—teemed with Jewish artisans and merchants during Roman times and for more than 1,000 years thereafter, when it served as the geographic center of Mediterranean commerce. Jews, however, were expelled while Spain ruled the area in the 16th century—unless they agreed to convert, which some did, taking their Judaism underground. The region, which also included Sicily, never regained its popularity among Jews, even after they were allowed to return in the 18th century and Italy was unified. By then, the best opportunities had shifted north. At the end of the 20th century, there were so few Jews that kosher products, when needed, were brought from Rome. In recent years, there have been flickering signs of a return of communal life. Most activity has occurred as a result of a convergence of trends—a worldwide boom in overseas travel, a passion for exploring genealogy and more viable economic opportunities. New initiatives range from informal opportunities for local residents to explore possible Jewish roots “culturally, socially, ethnically or gastronomically,” as Aiello puts it, to a formal conversion (sometimes called return) program started two years ago by Rabbi Pier Paulo Punturello, the Orthodox rabbi of Naples. His congregation of 200 members was for decades the only functioning synagogue in southern Italy. In another sign of a Jewish reawakening, Rabbi Alexander Popivker along with his wife, Sarah, opened a Chabad House in Naples three years ago. 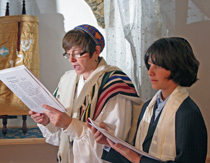 They offer Shabbat services and meals, kosher products, guest accommodations for Orthodox travelers as well as classes for unaffiliated Jews and those of Jewish descent. “It was strange for us to see Jewish tourists but no serious Jewish presence,” Popivker said of his inspiration to open the house. But perhaps the most moving sign of renewal is Jews at prayer in a 13th-century stone synagogue in Trani, a walled seaport on the southern Adriatic coast near Bari. Previously known as Santa Maria Scolanova, the Gothic structure was built in 1247 to serve the port’s thriving Jewish quarter. But after the Jews were expelled, it was handed over to the Church. Following requests to lease the space back to the Jewish community, it is again possible to step inside this ancient synagogue—whose soaring archways, domed ceiling, wrought-iron candelabras and recessed leaded windows are more evocative of a dining hall for medieval knights than Hebrew worship—and hear the familiar chants of Shabbat morning services. When she asked why the participants had come, “al­most all of them told stories about possible Jewish roots,” she said. Aiello now has an informal congregation—Ner Tamid del Sud (Eternal Light of the South)—of about 80 peo­ple. She is working with eight conv­ersion students this year, though her work is controversial in Italy be­cause Italians have only practiced Orthodox Judaism. Aiello belongs to the World Union of Progressive Judaism. She moved to Serrastretta several years ago after re­purchasing her family’s ancestral home. Her father, who traced his Jew­­ish heritage back to Toledo, Spain, and her mother, who was originally from Sicily, had fled the village during the Fascist period. While living there they had practiced their Juda­ism in secret. Two years ago, Aiello’s congregation celebrated what is believed to be the first bar mitzvah in 500 years this far south. It became a newsworthy event for the regional center of La­mezia Terme, where it was held. “We felt like ce­leb­rities,” said Wendy Wald­­man of New York, whose son, Tyler, was the bar mitzvah boy. And the increasing stature of Ner Tamid del Sud was emphasized earlier this year when the Torah Museum of Apollo Beach, Florida, gave it a 300-year-old scroll ori­ginally made in Italy. The same atavistic connection to Judaism among local residents has been noticed by the Popivkers. Over the last four years, they have taught about a dozen local people the basics of Judaism and have entertained some 30 more during festivals. Even American scholars are weigh­ing in with the arrival of a new academic publication. The Journal of Spanish, Portuguese and Italian Crypto Jews was founded by Abraham D. Lavender, a sociology and anthropology professor at Florida International University in Miami. Jewish tourism has added another element of interest. Three years ago, Eli Danzig, an Italian Jew born in Bari who now lives in Israel, began offering “kosher holidays” in the re­sort town of Paestum, 18 miles south of Salerno. “It is near some of the fa­mous sites like Pompeii and Capri,” he said. “We could also visit the synagogue of Naples.” Other of­fer­ings include the Jewish heritage tours run by Amalfi Life. Jewish tourists are no doubt attracted to the ancient history of their people in the region. Before the Jews’ expulsion in the 16th century, the Kingdom of Naples was a celebrated center of Jewish scholarship. A 12th-century legend tells of four rabbis who left Bari by boat to spread Torah learning throughout the world. Tak­en captive on the high seas by Mus­lim pirates, they were re­deemed in four different places—Tunisia, Egypt, Iberia and Provence—where they established centers of Jewish learning. Southern Italy was also renowned for its Jewish manuscripts and printing. A growing number of non-Jewish Italian historians have also started to explore the contribution of Jews to this swath of Italy. Projects have in­cluded the creation of a Holocaust memorial website, launched last year by Fabrizio Lelli, professor of Hebrew lan­guage and literature at the Uni­versity of Lecce—a new position created in 2001 that underscores the spread of Jewish culture into southern Italy. The site, which features photos of murals and graffiti as well as Jews sent to transit camps in the town of Santa Maria al Bagno after World War II, is intended to commemorate the experiences of the refugees and the local Italians who befriended them. Vittorio Perrone, a teenager during the war, was riding his bicycle one day when he happened to meet Jacob Ehrlich, a youngster living in a transit camp. They became friends, sharing Perrone’s bike. Last year, after staying in touch by mail for over 50 years, Ehrlich—who became an optician in New York—was invited by the village to visit his old friend and receive an honorary citizenship. This historical symbiosis between Jews and southern Italians is no doubt on account of heritage. As many as 50 percent of southern Italians may have Jewish blood, notes Vincenzo Villella, author of The Jews of Calabria (English translation available on CD). In his area of Puglia, Lelli said he has met dozens of families with names such as Calò (from the Greek word meaning beautiful which, in the Greek Jewish tradition, was a shortened form of Kalonimus—good name or shem tov in Hebrew). The area’s Jews spoke Greek until around the 11th century. Lelli also finds families with last names reflecting a town of origin with a known Jewish history, such as Trani. Even certain local customs reflect a Jewish past. Lelli discovered a handful of women in Trani whose families have always attended church on a par­­ticular week in midsummer that coincides with Tisha B’Av. Aiello talked about meeting Gianna Furci, a woman whose grandparents were wed “under a blanket” given to them as a traditional marriage gift. On another occasion, Aiello paid a condolence call and found the family sitting on low chairs. Time and again she has met families that avoid eating pork. Jewish leaders are also receiving scores of e-mails from locals as well as Italian Americans, asking about possible Jewish ancestors. To assist American families, a conference titled “I’m Italian. Could I be Jewish?” was held in Sarasota, Florida, last February. Recent historical findings are likewise destined to play a role in putting southern Italy back on the Jewish map. Discoveries include the Jewish catacombs at Venosa, possibly the largest Jewish catacomb in Europe; and a 2,000-year-old tombstone bearing an emotional epigraph by a Jewish woman brought captive from Jerusalem after the sacking of the Second Temple. Unearthed over 100 years ago but largely ignored, it is now on display at the National Archaeological Museum in Naples. Meanwhile, Lelli is analyzing clues to the migrations of the Jews who were expelled, based on where their unique liturgy later emerged. Scholars in Sicily are also finding evidence of lost synagogues under churches and writings suggesting the use of amulets and other magical talismans rarely found on the Italian mainland—clues of strong ties to the Islamic world, mainly Egypt and North Africa—and unexpectedly large numbers of people of Jewish descent. André Aelion Brooks can be reached at andreebrooks@hotmail.com.